Be sure to make your choice of vanity bench style at the top of the listing! Each listing includes FREE hand mirror & purse mirror! Mirror size, shape & color may vary! 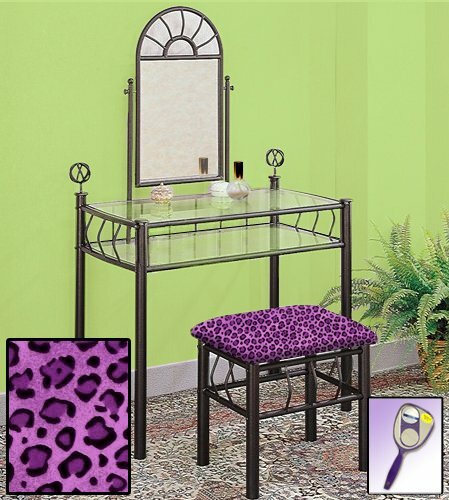 This listing is for the dainty black finish metal make up vanity table with mirror and the seat cushion bench with the theme of your choice! The mirror is able to be adjusted and the vanity table features 2 glass shelves! This vanity is made well and will last. Isn't it elegant? Be sure to notice the beautiful sunburst style accented with two bobbles on the vanity! Your little one will feel like a princess with this set! The seat cushion bench with your choice of themed fabric is included with the vanity. Vanity: 34" Wide x 19.25" Deep x 55" Tall (To Top of Mirror) Bench: 18" Wide x 13.5" Deep x 17" Tall Check out our additional photos to see close-up images of the fabric used on the seat cushions! Be careful when trying to do color matching between your products and ours. Actual colors may vary depending on your computer monitor settings. We are not responsible for differences between your furniture and ours. We have a variety of different color choices with the seat cushions on the bench and we also have this same vanity in a white finish - be sure to check our other listings! If you have any questions about this product by The Furniture Cove, contact us by completing and submitting the form below. If you are looking for a specif part number, please include it with your message.